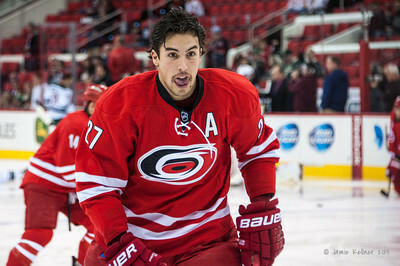 Quick Sunday update on Justin Faulk, Kevin Shattenkirk and Patrick Sharp. We knew the Hurricanes were prepared to move some of their defensive depth, but we didn't think they'd be willing to move their number one guy. Some in the hockey world are convinced Faulk is in play at the deadline - and the Oilers could be a fit. It had been speculated that Faulk was potentially a target for the Avalanche, with Duchene likely going the other way. This strikes you as an offseason move, but it's something to keep an eye on in the last days before March 1st. The Shattenkirk sweepstakes carry on into the last few days before the deadline. The Penguins and Capitals are now reportedly in the mix, adding to an extensive list of contenders: Boston, Toronto, New York, Edmonton, San Jose and Anaheim. Not to mention potential contenders in free agency: Colorado, New Jersey and Detroit. Tampa Bay and Arizona would be interested in Shattenkirk as well, but the feeling isn't mutual. Florida would be a seriously good fit for Patrick Sharp. GM Dale Tallon knows the player well, the team has stated their desire to get help on the wing, and have lamented their powerplay. They've also got the cap space to make it happen. Could be nothing, but the Sabres have recalled goalie Linus Ullmark. Pending UFA Anders Nilsson could be available as many contenders (Boston, Los Angeles, Washington, San Jose) are looking for depth in goal. It's that time of year where every little move gets extra scrutiny.